Marblehead's King Hooper Mansion	(1728) is a historic house still in active use as the headquarters of the Marblehead Arts Association. Marblehead's Robert "King" Hooper Mansion (tel 781-631-2608), 8 Hooper Street, more or less across the street from the Jeremiah Lee Mansion, is a smaller house and older. Built in 1728, with a Georgian façade added in 1747, it has been occupied since 1938 by the Marblehead Arts Association, which offers tours of four floors and five galleries for free. The art exhibits change each month; there's a gift shop. Visit any day except Monday from 12 noon to 4 pm, Sunday 1 to 5 pm, for free. 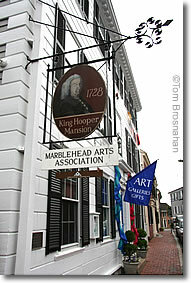 King Hooper Mansion (1728), home of the Marblehead Arts Association.